Mark your calendar: Dec. 11 is being publicized as "Balance Transfer Day," with Americans urged to transfer their credit card balances from high-interest cards to low- or no-interest ones. Still, don't let any of that turn you off from the idea of transferring your debt or making some other changes. There are many good reasons to consider doing so. 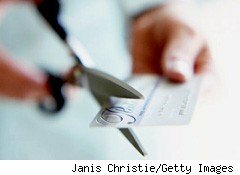 The main reason to move your debt to a lower-interest-rate card is simple savings. Imagine that you owe $10,000 on a card that's charging you 20% annual interest (which is far from unheard of). That's $2,000 annually in interest alone. If you can move that to a card charging you 10%, you'll save $1,000 -- which can go a long way toward paying off that debt. Note that with a few exceptions (such as the first card above), you will typically pay a fee to transfer your debt -- a fee that can be substantial. Factor this into your calculations. Ideally, aim to pay off your debt entirely during the introductory period, with its ultra-low rate. If you don't think you'll manage, be sure to switch to a card with a good regular rate. Be good about paying your bills on time, as a late payment can suddenly terminate your introductory period, slapping you with higher rates earlier than you planned. And finally, be careful when shopping around. A lot of credit applications can show up on your credit history and lower your score. By moving your account, you can also send a useful message to big banks (and big business in general). Banks have been adding many fees over the years, grabbing more and more money from their customers in a tough economic environment when savers have received close to nothing in interest, due to low rates. When many people move their money, banks notice. It's estimated that in the five weeks leading up to Bank Transfer Day, savers moved more than $4.5 billion from big banks to credit unions. Still, you don't have to move your money to make a difference in your bottom line. You can prevent big financial companies from profiting too much off you by employing good personal finance habits. Pay your bills on time and you won't get socked with late fees, which can also keep your credit score from getting dinged. Spend a little time shopping around for the best deals and you can end up with banks, brokerages, credit unions, credit cards, and debit cards that serve you best. And don't worry if your calendar is already full on Sunday. Credit unions, which have deservedly benefited from these transfers, have suggested that "Every day is Bank Transfer Day." If you can't get to it on Sunday, look into it on Monday. It is best not to put it off too long, though -- procrastination may cost you hundreds of dollars. Longtime Motley Fool contributor Selena Maranjian owns shares of JPMorgan Chase, but she holds no other position in any company mentioned. The Motley Fool owns shares of Bank of America, Citigroup, Wells Fargo, and JPMorgan Chase, and has created a covered strangle position on Wells Fargo.